FRIDAY, Nov. 7, 2014 (HealthDay News) -- Keeping supplies of epinephrine in schools saves lives, a new study finds. Epinephrine injections are given when someone suffers a life-threatening allergic reaction (anaphylaxis) to food or an insect sting. This study found that stocked emergency epinephrine was used on 35 children and three adults who suffered anaphylaxis in Chicago Public Schools during the 2012-13 school year. The drug was administered by a school nurse in three-quarters of the cases. Sixty-three percent of the incidents occurred in elementary schools and 37 percent in high schools. The most common causes of food-related anaphylaxis were peanuts (55 percent) and fish such as salmon, tuna and flounder (13 percent). The findings were scheduled for presentation Friday at the annual meeting of the American College of Allergy, Asthma and Immunology in Atlanta. "We were surprised to see that of those who received the epinephrine, more than half of the reactions were first-time incidents," study author Dr. Ruchi Gupta said in a college news release. "Many children are trying foods for the first time at school, and therefore it is critical that schools are prepared for a possible anaphylactic reaction." 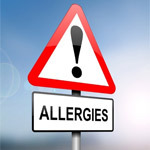 In the United States, about 15 percent of school-aged children with food allergies have had an allergic reaction at school, the news release noted. About one-fourth of epinephrine injections given at schools involve children who didn't know they had an allergy. "Stocking emergency epinephrine is a medical necessity for schools in every state," Dr. Bryan Martin, college vice president, said in the news release. "In addition to protecting those whose epinephrine auto-injector isn't immediately accessible during a reaction, stock supplies help save the lives of those who experience an anaphylactic reaction and don't have a prescribed epinephrine auto-injector," he said. Currently, 41 states have laws recommending schools stock epinephrine. A common brand name is EpiPen.